At the risk of boring you all rigid, I’m pleased to show you my latest magazine submissions! I didn’t realise I would be twice featured in the October issue of Quilt Now (out in UK this week). The theme this issue is ‘Single Block’ designs. I thought, ‘what would happen if you take a traditional block and pull it apart!’ (sad, the places my mind goes!). 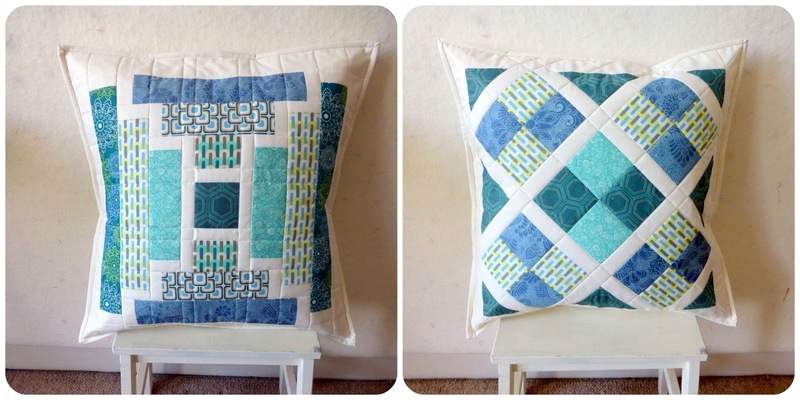 First I created a mini quilt (30″ x 30″) based on a dissected ‘churn dash’ block. The old grey matter kept smokin’ and out came 2 more blocks which I turned into cushions. Keeping to a Kona Snow background with a limited colour palette helps achieve the effect of the dissected blocks. I actually made this first, back in May. Inspired by the ‘Antique Tile’ block I started pulling fabrics that I thought would represent the depth of colour in Moroccan Tiles. The trivet was simply an after-thought, using up the leftovers!! I hope you don’t mind me sharing my publications here! I’m not trying to blow my own trumpet – it’s just so nice to finally be able to show you stuff I’ve made which I’ve had to keep under wraps for a bit! And just to give you some warning – there are lots more publications in the pipeline!! Previous Previous post: Blackberries and Maples! Next Next post: Absence Makes the Heart Grow Fonder!